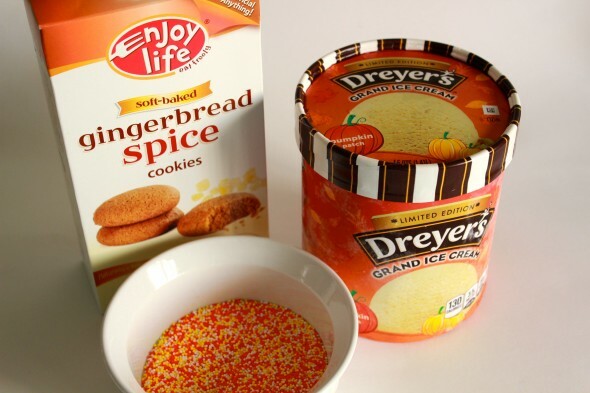 This is the perfect early-fall treat considering the weather in many parts of the country is still somewhat warm. Instead of baking all the amazing pumpkin items (which I can’t wait to bake in cooler weather), I grabbed the first pumpkin ice cream I spotted at the store and sandwiched a spoonful between two soft gingersnaps. I love ice cream sandwiches made with delicious, soft cookies. Any Diddy Riese fans out there?! I bet they have a bomb fall inspired ice cream sandwich. I may have to make a trip up to LA for one. You can find my Snickerdoodle Coconut Ice Cream Sandwiches, here. 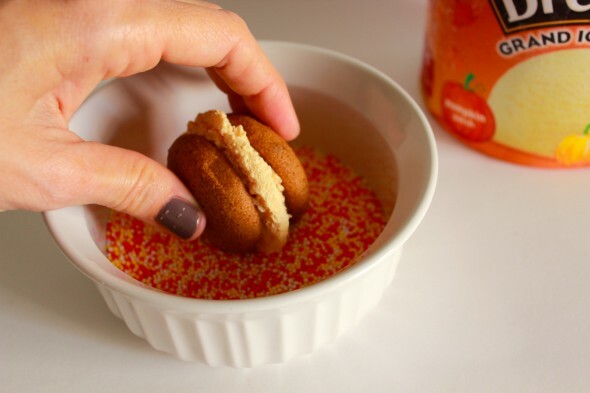 *Sprinkles aren’t necessary to make this treat taste delicious, but they do make the mini sandwich look pretty. These look amazing, yummy and easy. Never saw soft ginger snaps before. They’d be dangerous in our house. Ummmmmmm, I want these made again when I’m back home! Hi Barbara!! I am so happy I found your blog! This is TOOO cute and these mini sandwiches look SO yummy! I LOVE fall and all the pumpkin that is around!